Cameroon president Paul Biya says he has successfully pushed the militant group Boko Haram beyond Cameroon's borders and urgently needs to be re-elected in the October 7 presidential poll so he can rebuild what was destroyed. Biya was in the northern town of Maroua in one of his rare outings from his presidential palace to launch his campaigns for the presidential election. Women dressed in President Paul Biya's Cameroon People's Democratic Movement (CPDM) party attire sing Saturday to welcome Paul Biya to Maroua. They are assuring Biya that they will vote for him to lead Cameroon in a new seven year mandate beginning October 7. More than 30,000 people ferried by the CPDM party from all over northern Cameroon are present in Maroua. Biya's campaign photos can be seen everywhere in the town. Paul Biya told them he has come to give his assurances of his love for the people of northern Cameroon. He said he has decided to visit Maroua as a sign of the high esteem he has for the people of Cameroon's northern border with Nigeria and because he wants to inform them of the new opportunities he will offer when re-elected. He said he cherishes the people of far north Cameroon because they resisted the destruction, burning and killing by the barbaric group Boko Haram and now that terrorism has been defeated, it is time to create conditions for a return to normal economic, administrative and social life. Paul Biya said he will improve agriculture, start the exploration of what he said was the rich natural resources of the region and build a rail line to link north Cameroon and Chad to spur economic activity now that peace has returned and Boko Haram has been defeated. 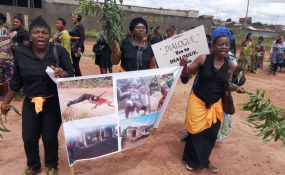 As Biya and his crowd of over 30,000 met at the Lamido Yaya Dairou Municipal Stadium, about 200 supporters of opposition candidate Maurice Kamtos of the Cameroon Renaissance Movement Party (CRM) campaigned on the outskirts of Maroua. Yimnyo Mamadou who leads the campaign rally said Paul Biya was deceiving the masses. He said Biya has been responsible for the underdevelopment of Cameroon. He accuses Biya of not being sensitive to the needs of his people and hardly visits them. He said Biya has distracted Cameroonians for 36 years and it is high time the people are told the truth and made to understand that Biya has not provided an enabling environment for their education, has not provided basic needs such as water and does not pay civil servants well. He said Biya should be truthful to himself and acknowledge that Cameroon is in a pitiful state. Paul Biya who is likely to win at the the polls has not announced that he will visit other regions of the country where there is or has been unrest.